Charles-Ferdinand Latrille, Comte de Lorencez and leader of the French expeditionary force in Mexico, was in full retreat. His goal, march to Mexico City and harshly extract the money that was owed to them by the Mexican government, was thwarted by less experienced, poorly armed group of fighters in the fortified city of Puebla. As he pulled his beaten army back to the safe territory of Orizaba, the Mexicans were celebrating what would turn out to be more of a morale booster than a permanent victory that drove out the French. Four days later, President Benito Juárez declared that May 5, 1862 would be a national holiday, referred to as “Battle of Puebla Day” or “Battle of Cinco de Mayo.” As history now shows, that celebration was going to be short lived. President Juárez was aware of the trouble Mexico was facing. After years of conflict with the United States over Texas, then a civil war that was known as the Reform War (1858-60), Mexico was flat out of money. When Juárez was elected to the presidency, one of his first acts was to cease payments to their international creditors. This did not sit well with Britain, Spain, and France, who were building empires and needed to pay armies and merchants. They laid aside their enmity for each other and formed the Triparte Alliance, with the goal of taking Veracruz and squeezing what they were owed out of it. Britain and Spain were not overly keen on waging a long war with Mexico, and were willing to sign the Treaty of Soledad as compensation. Satisfied, two of the three members of the alliance headed home. France, which was owed the least amount by Mexico, was not there to collect money. They were there because Napoleon III was looking for a French base of operations in the Americas. This would give him an opportunity to expand French and Catholic influence in these new lands, building the empire to rival that of the British. They were in for the long haul. General de Lorencez had every right to be confident he was going to win the day. He was a veteran of the Crimean Wars and led a well-trained and well-armed group of over 7,000 soldiers into battle. The 4,000 or so Mexican troops hastily pulled together to stop his march to Mexico City was led by General Ignacio Zaragoza, a hero of the war with the General Santa Anna. General Zaragoza tried to engage with the French forces at the Alcuzingo Pass, but were forced to retreat to the fortified city of Puebla. Cerro de Guadalupe, a fortified convent, was the focal point of the battle. De Lorencez grossly underestimated the abilities of the Mexican forces rallied against him. After two assaults where he threw all the artillery he had against the fortress, all he had to show for it was a French flag raised for a brief moment. The third assault, not supported by artillery, was where General Zaratoga pushed them back permanently. As the French pulled back, he sent the cavalry in to add to the chaos. 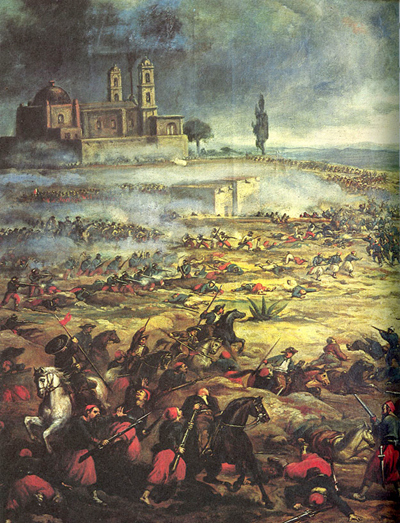 The Mexican forces lost roughly forty troops, compared to the French losses of over 800 soldiers. When we hit the bars on May 5, most patrons are going right for the tequila, Corona, and possibly mezcal if you are a fan of smoke. There are other options, which should include a French ingredient as a nod to history. The first option involved tinkering with what would happen if you took a Paloma and a French 75 and combined the two. The result was a mezcal-fueled twist on the French classic. Pour the mezcal, grapefruit juice, and agave syrup into a mixing tin. Add ice, then shake for 20 – 30 seconds. Strain into the flute, then top with the Champagne. Stir, add the grapefruit twist if you choose, then serve. Tip: If you are going to use the garnish, peel the twist before you pour in the bubbly. The Champagne may get a little frisky and try to bubble over. Use the twist to break the surface tension and get the bubbles back in line. This is full of smoky goodness and a little punch from the citrus and bubbles. Which is proper, considering how the Mexicans were able to overwhelm the French. If you are not a fan of that flavor profile, this cocktail works just as well if you substitute tequila blanco for the mezcal. You could also add a few dashes of Calvados, such as 2015 NY International Spirits Competition gold medal winner Boulard XO, to give it an apple kick. Through the research for this cocktail, there was a long discussion on the Michelada. Beer cocktails, which have been seeing a rise in popularity, though they are not as well-known as a black and tan or a shandy. This is a combination of spicy tomato juice and Mexican lager, typically with a spicy rim. Spicy tomato juice is best known as a mixer with the Bloody Mary, but the people of Mexico will enjoy it with their tequila as a chaser (known as a sangrita). It enhances the pepperiness and spiciness that is inherent in the tequila. The plan was to substitute hard cider, a staple in the north of France, for the beer and still keep the spiced tomato juice. Through researching spices and sauces in Mexico, it turns out that one of the more famous ones, mole poblano, is strongly connected to the city of Puebla. The most widely reported story is that the nuns of the Convent of Santa Rosa in the 16th century were expecting a guest: The Archbishop. Panicked, they gathered spices, chiles, old bread, and nuts, combined them together into a thick sauce, and served it over turkey. The Archbishop loved it, and it became a tradition in Mexico to have it for the holidays. Like any good recipe that was thrown together on the fly, there is really no recipe for it. But there are some common ingredients like ancho chili, Mexican chocolate, some form of bread, onion, almonds, cinnamon, and some tomatoes. Recipes can be “simple,” containing 12 ingredients and taking an hour to make, or as complex as thirty-five ingredients and up to seven hours to make. After looking through the recipes, it became pretty clear as to why it was a rare treat. The end recipe utilizes a variation of mole sauce as a flavoring, Ancho Reyes chili liqueur, dry cider, and tomato juice. Pour all of the ingredients into a highball glass and stir. If you are going to use the cinnamon sugar rim as a garnish, wet the rim with a little lemon juice and roll the rim though the cinnamon sugar mixture. There are two routes to making the mole sauce for the cocktail: homemade and store bought. Store bought is much easier to work with on the fly, obviously. It is typically found as a paste you add to chicken stock to turn it into the thick sauce. The peppers are already in it, but they were so tame once they were in the cocktail the full measure of Ancho Reyes is still warranted. In mere minutes you have a perfect addition to a cocktail. Homemade is going to take much, much longer, with a longer list of ingredients and a considerable time commitment (The Seattle Times offers these two recipes, the second of which I experimented with). You may not want to make it for cocktails specifically, but if you are going to make a batch for Cinco de Mayo anyway, why not increase the recipe for some cocktails? The story has a happy, if delayed, ending for the people of Mexico. While an inspiring show of determination, the French responded by sending 30,000 troops in September. The new general swept into Mexico City with far less resistance. Napoleon III had what he wanted for just over five years, until the Mexicans rose up and executed Don Maximiliano I, Emperor of Mexico, in 1867. The United States celebrates Cinco de Mayo with a little less fervor than Mexico does, but they see the day from a different perspective. By digging into the history of the day, we may be able to mine other unique ways to acknowledge this act of defiance by the Mexican army and the people of Puebla. After all, we do have a certain affinity for revolutions against more powerful forces.